Imagine what the world would look like if kids learned at a very early age not only how to handle money, but how to make the most of it. 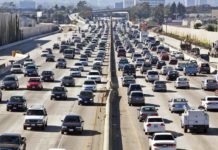 I imagine a diminished U.S. national debt, paid off cars and mortgages, and no such thing as credit card debt. But that education would have to start early, and since not many of us had the luxury of learning the ins and outs of money while we were still young, that kind of world is still a pipe dream. Today’s kids, however, have the chance to be the generation that builds a more money-smart society. Kids are already learning from educational software programs and kids websites for money management, and fortunately, a few of the best finance apps are designed specifically for kids and their needs. 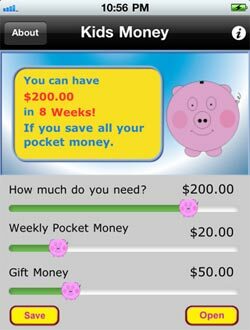 Free and low-cost apps offer great help when you’re teaching your kids about money. Below are some of the best apps for devices like the iPhone, iPod, iPad, and Android smartphones. P2K is specifically geared toward kids’ simple financial needs. It teaches children to keep track of income like an allowance or payments for doing chores. It also offers cute motivational features such as the ability to include photos of wish list items and an option to view a history of purchases and decide whether they were worth the cost or not. 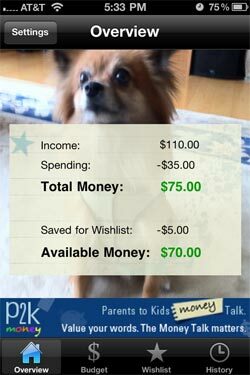 Kids Money, by Apps Rocket, teaches your child about saving and planning for long-term purchases. 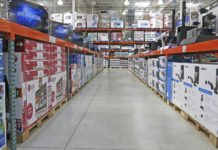 When your kid finds a bigger-ticket item that they want to buy, like a bike or guitar, he or she will input the price of the item along with expected earnings. The program will help your kids evaluate – and meet – their goals. For instance, if your child wants to buy a $200 bike item with a $20 weekly allowance, the app will report that it’ll take ten weeks of no spending to save enough money. And when other expenses come up, the program will subtract that amount and provide a new estimated purchase date. Mass Mutual developed Save! The Game to teach kids the difference between needs and wants. 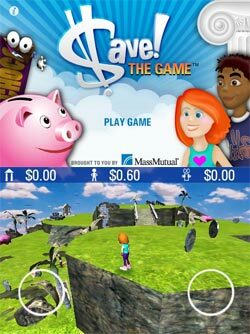 In this 3D virtual fantasy game, kids collect money and have to avoid losing it all to the “I wannas.” Conveniently, the game fits in well with Mass Mutual’s Time for Kids website, which has plenty of valuable money lessons for kids. Designed by Gomu Gomu, the Bank of Mom app will teach your kids about lines of credit. You can give your kids a cash credit for their allowance or to pay them for chores. When they want to make a “withdrawal,” they request one from their “bank,” which you control. In addition, kids can bank time for leisure activities like watching TV, playing video games, or going to the mall with friends. For instance, if your child raked the leaves, he or she can bank that time and then withdraw “credits” to use for time at the movies with friends. You can manage multiple accounts with the app, and even email transaction details to your kids. Teaching kids about money doesn’t have to be boring. In fact, with the right apps and games, money management can become your kid’s favorite subject. Do you know of any great apps that I haven’t mentioned here? If so, share them in the comments so others can use them to teach their kids!